Letz Zep returned to Brazil for further dates, after the huge success of last year’s tour of South America, where they performed to a crowd of 70,000 avid rock fans in Mexico, when they opened the show for Jane’s Addiction. The band was being interviewed at the offices of Kiss FM, in Sao Paulo, the biggest rock radio station in Brazil. Were they were confirmed as ‘The Number One tribute to Led Zeppelin’, by the station and its listeners. Upon leaving the building they found themselves caught right in the middle of the local riots. People were protesting about the rises in fares in the city. As the drama unfolded they found they had become the target for the tear gas and rubber bullets fired by the police whizzing past them, and the tear gas landing just a few feet beside them. The band hastily made it to their awaiting car, under the watchful eye of shotgun wielding riot police. The next evening, the sell out show at the HSBC Music Arena, Sao Paulo, Brazil. Letz Zep were introduced to Bill Medley, of the Righteous Brothers. Bill had requested a meeting with the band personally, though it may have been a case of mistaken identity! He commented on his admiration for the work of Led Zeppelin, and remarked the bands recreation of the show was ‘impressive’. Bill is a true gentleman and a legend! It was a great honour to meet with him. SANTANDER – SPAIN - More than €20,000 was stolen from the safety deposit box of Letz Zep, a British rock group. In a startling similarity to the infamous theft at The Drake Hotel in 1973 of the Box Office takings for Led Zeppelin, after their show at Madison Square Gardens. The daring robbery was as the band were in Santander, Spain, at the beginning of their 2013 World Tour. There were five passports, cash and personal belonging amounting to between €20,000 and €25,000 was missing. Detectives who went to the scene no indication the safety box had been forced open. The group's manager, Robert Mills, told detectives they kept the cash on hand because they have "A lot of expenses to pay"
and singer Billy Kulke gave the performance in their nine day engagement on the Sunday night after learning of the theft. Tour manager Mark Stone was taken away for further questioning by the police. ‘The similarity between the two thefts are startling’ said a spokesman for the band. The $203,000 in cash stolen from Led Zeppelin at the Drake Hotel in New York has never been recovered, nor have any arrests been made in conjunction with the heist. At the bands show in Estapona, Spain. 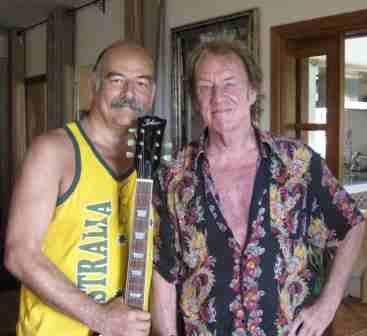 None other than guitar legend Alvin Lee turned up to watch Letz Zep perform. Letz Zep make it into Popular culture!! In an entry exam to a university in Sao Paulo, Brazil. 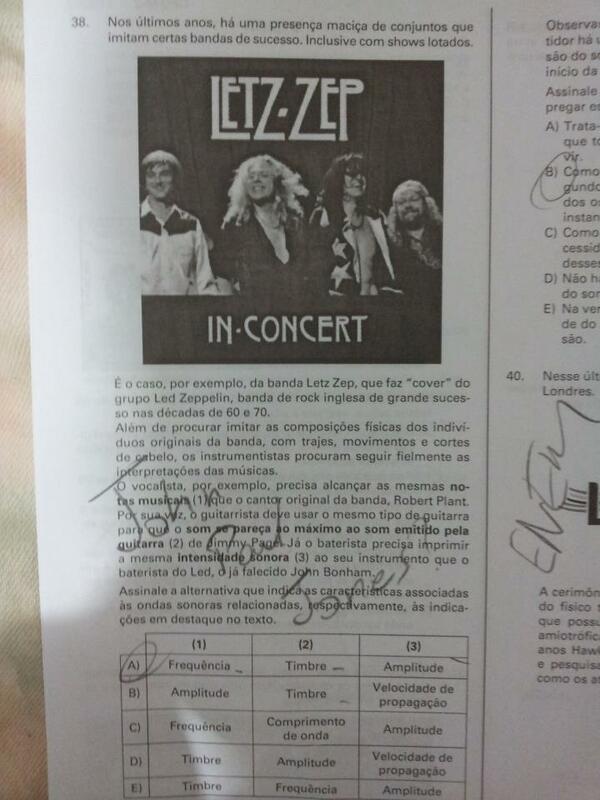 One of the questions on physics is on Letz Zep! It was asking about frequency, timbre and amplitude and sound waves Letz Zep needed to achieve in order to recreate the sounds of Led Zeppelin! Letz Zep, following on from the hugely successful tour in 2011, return to South America. The band perform at Via Funchal in Sao Paulo on May 17, and Porto Alegre on May 19. We look forward to returning to Brazil, look forward to seeing you all again! Os ingleses do LETZ ZEP, o único tributo do LED ZEPPELIN autorizado pelos membros originais,Robert Plant e Jimmy Page, estão de volta ao Brasil para duas apresentações, em São Paulo, dia 17 de maio no Via Funchal e em Porto Alegre dia 19 de Maio no Bar Opinião. O LETZ ZEP, reproduz com fidelidade a “experiência única “ de um show do LED ZEPPELIN,tanto que a banda foi convidada pela gravadora do LED ZEPPELIN para tocar na festa de lançamento da coletânea MOTHERSHIP do próprio LED ZEPPELIN.